DETROIT, July 11, 2018 /PRNewswire/ -- Today, Scandi Electronics announced the availability of its revolutionary flagship product: Swings—Bluetooth earrings for pierced ears—as part of a recently launched Kickstarter campaign. "'Why Don't My Earbuds Fit?' 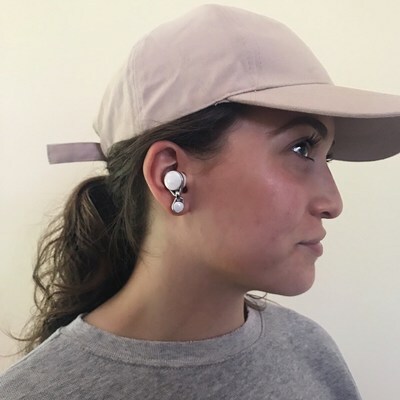 has been a frequent article subject in about every publication, from Self Magazine to Wired to the New York Times," Melissa Eldridge, a consumer electronics expert with over a decade of experience and the creator of Swings Bluetooth Earrings, said. "After years of struggling to keep my own earbuds in, I knew there was an opportunity to make a better product. Swings, are simple to wear, provide stability and combine function with fashion!" Users wear Swings as earrings and then can "swing" them into the ear when they want to listen to audio—providing functionality and stability. With advanced audio technology that has transformed it into wearable art, users describe Swings as "lightweight and comfortable, with impeccable sound." Designed "by women, for women," Swings come in three distinct versions: Swings, Swings Sport, and Swings "Bling" Swarovski Crystal. Swings are available in multiple color combinations, including silver/white, gold/white or rose gold/white. Swings Sport are sweat-resistant and shockproof, and feature lightweight, silicone bands. Swings Sport combinations include: sleek all-black or upgraded Swings Sport Color pack, in violet, yellow, pink or red. Swings Swarovski Crystals are available in gold, silver or rose gold. Swings Sport retail for $179 MSRP, and are available during the first 48 hours of the Kickstarter campaign for $129. Swings retail for $249 MSRP, but are available through the Kickstarter campaign for $179. Swings Bling Swarovski Crystal Encrusted Swings retail for $349 MSRP. The Swings Bluetooth Earrings Kickstarter campaign is live now through Aug. 25, 2018. BRANDed PR for Scandi Electronics: Klint Briney, 305.915.7652, klint@brandedmgmt.com.